With the fast coming of 2013 Christmas holiday and its fellow New Year, this holiday season is becoming heated up, not only for the festivals but also because of the discounts, freebies, special offers in both online shops and local malls. That means we are in a holiday season in which we could not only fully enjoy the holiday but also purchase more wonderful items at low price or even no cost. The whole holiday is becoming exciting. 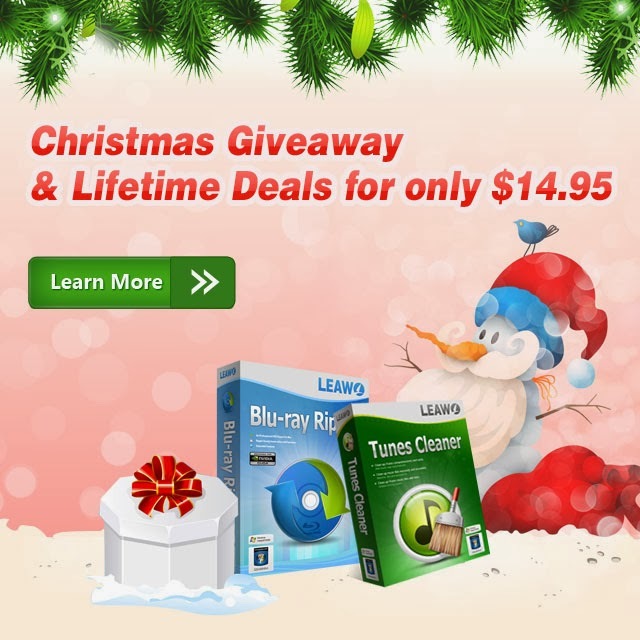 To bring you more surprise and excitement, Leawo Software, Inc. is running a 2013 Christmas Giveaway activity to give out their flagship Blu-ray Ripper and Tunes Cleaner, in both Windows and Mac versions, as 2013 Christmas gifts to everyone. The Giveaway will start on Dec. 27th and end on Jan. 7th. Leawo doesn’t set limit on the copies of these two giveaways (actually 4 giveaways, 2 items for 2 OS respectively), thus all people get a chance to win one copy of licenses for totally free. What could Leawo Blu-ray Ripper do? In a word, Leawo Blu-ray Ripper is a professional Blu-ray ripping and converting program that could decrypt, rip, and convert Blu-ray/DVD movies to videos and audios in multiple formats for multiple uses. This Blu ray Ripper software could convert Blu-ray/DVD to video in AVI, FLV, MPEG, WMV, MOV, MKV, MP4, etc., and extract audio off Blu-ray/DVD movies to save in MP3, AAC, M4A, etc. It could convert Blu-ray/DVD to video/audio for multiple uses: playback on Apple media devices, Android smartphones and tablets, Windows media players, various smartphones, etc., editing in professional editors like FCP/FCE, iMovie, WMM, etc., or uploading to YouTube or blog for sharing. This Blu-ray Ripper program allows users to edit source Blu-ray/DVD movies via the internal video editor, create 3D movies out of 2D Blu-ray/DVD sources, adjust the video and audio parameters of final video/audio files, etc. How to Get Leawo Blu-ray Ripper Giveaway? 1. Visit the Christmas giveaway page. 2. Select the OS requirement (Windows or Mac), and then click green “Get Keycode Now” button. 3. You’re required to enter personal email address, which is used to receive the Blu-ray Ripper download link and license code. After you register with your own email address, click the little green “Get Keycode Now” button. 4. After that, check your email inbox to get the download link and license. What could Leawo Tunes Cleaner do? For music lovers, Leawo Tunes Cleaner is no doubt a wonderful assistant to make music enjoying more enjoyable. It is an iTunes cleaner program that could smartly clean up iTunes music library and other music collections on computer. As a professional iTunes cleanup program, it could detect and delete song duplicates in iTunes, get album artwork for iTunes music files, download and add music tags like album, song name, artist, year, etc. to complete music info, allow manual editing of music tags, save unfixed music files for future fixing, apply fixed music files to original folders, etc. With this iTunes cleaner program, music lovers could get a clean and tidy music library. How to Get Leawo Tunes Cleaner Giveaway? 3. The pop-out box would include download link and license code for you. These 2 Christmas giveaway gifts from Leawo Software are all valid for only 1 year. Leawo offers high-discounted offers for lifelong licenses upon these 2 apps: Blu-ray Ripper at $19.95, 55% off, and Tunes Cleaner at $14.95, 62.5% off.